Techland, the developer of Dead Island, might have tried to do too much in a limited amount of time, resulting is a disastrous launch. I can't name a recent developer that has launched two full games on all three platforms (PC, PS3, 360), within two months of each other. In July of this year, Techland released Call of Juarez: The Cartel. It was a mediocre game, earning only a 47/100 Metacritic score. Now, less than two months later, they launched Dead Island. Trying to create two games at once might have been too much. Both games came out and felt like they could have used a couple of more months of testing and optimizing. 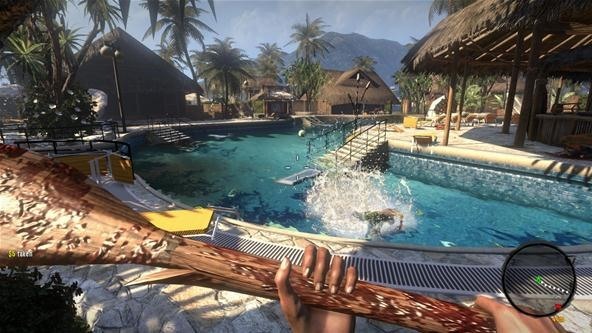 Dead Island might have also released early in order to avoid the winter rush of big name titles coming in October and November, where it would have been lost in the crowd. The game itself has promise. It is Dead Rising on a larger scale similar to Borderlands. There is a huge island to explore and one of the selling points is the ability to explore it with your friends online. Up to four players can join you in any part of the story. The multiplayer section of the game is something Techland did correctly. It is simple and easy. If you have your game set to open, any player online can join you, complete with integrated voice chat (or you can type if you're shy). Running around the other day in the island, it didn't take more than one minute for random strangers to join my game. The game also tells you if other games are open and if you would like to join them. The game matches you with other people according to their level and similar quests, or you could easily invite your friends directly. To reiterate, the online portion is to be commended, it is done very well. The story, NPCs, and playable characters range from bland to insultingly stereotypical. Voice acting from NPCs and playable characters is average, mostly due to the stale dialogue. The characters that you can pick have stereotypical story lines that would have been better left unwritten. That's one of the charms in the Left for Dead series: we get to know the characters stories and personalities as they progress through the game. Those characters didn't give any big speeches, but little by little, you can piece the small conversations together to form a general idea of what they character is about. 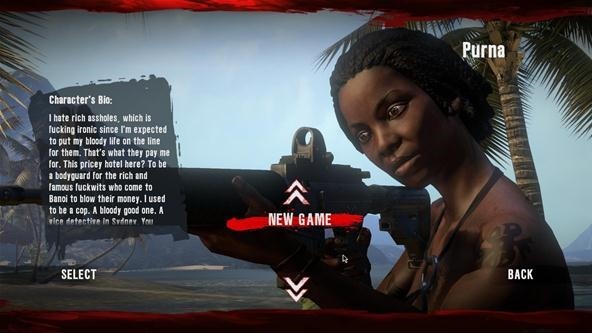 In Dead Island, Techland just placed template characters that are there only to pad the game play. Game play and combat is fun. Your character is slow, most weapons are slow, it is easy to get hurt. The game gives you the biggest challenge in single player. Playing alone, there is a sense of dread and danger than you don't have in multiplayer. There is no one else to cover for your mistakes or to look out for you as you move around. If you see a group of zombies you have to think whether you can take them on or not. Bosses are harder too, since there are no other players to distract them. The only negative is that it is obvious that this game was tailored for the gamepad. Switching between weapons is a chore and not keyboard friendly. Playing with other people is a bit unbalanced at the moment. There are simply not enough zombies if you are roaming the area in a four player group. If you play with four players you are invincible. Even tougher zombies are easy to take out as people take turns taking a swing. The game is also more chaotic with more people. Everybody is running around and they might not like to explore or look around. It's like game play on steroids. If they added X amount of zombies per player in the game it would solve the problem. Exploration is a mixed bag. Truthfully is not that fun to explore when all the loot feels the same. Some cash here, minor weapon there, repeat. There are not enough unique items to make consistent detours to random locations to explore. It's easier to just stick to the quests. With quests you get experience and rewards, and you get to explore too. It would be more fun if they had added more people to save or more unique instances to go to. This game holds a lot of promise. The multiplayer is easy to use and the combat is satisfying. I hope the game is mod-friendly and get some great contributions from the gaming community. If you love Dead Rising then get this game. If you love Left 4 Dead then get this game on a sale. Personally, the game left a sour taste from the botched launch, but I'm slowly starting to like it again.